> > see a further transformation in him. Um, no it can't. Clearly you didn't read the final sentence of my post. Quite unfair for Sutil, but I Mallya's got enough financial trouble without having to pay out Di Resta or Hulkenberg! There's certainly going to be some very good drivers on the sidelines in 2012! I suppose Jaime will get the HRT seat, and probably Sutil at Williams. Maybe Senna, Petrov or Buemi are a chance at Caterham if they (rightly) decide to tell Trulli to spend some more time at his vineyards. Jaime will get a drive somewhere. Even if RedBull have dropped him in the @#$%& - which would be rather stupid of them after his improvement during 2011 - he'll have no problem ultimately finding a drive with another team soon. He's too good. At Williams, I feel Rubens will get favoured over Sutil. He's more experienced and better at car development, and Sutil definitely won't be any quicker. That sort of lineup would be cool I reckon. > > > see a further transformation in him. > sentence of my post. no, i clearly read it and gave my oppionn on the matter, geez. well good luck for next year supporting a has been, if you want to see a transformation, go watch transformers. Schumacher will be respectable enough but chances are that he's not going to be winning races yet nor will Nico. I doubt the car will be a big enough improvement to properly challenge the Red Bull, Mclaren & Ferrari trio so they'll be routinely best of the rest with maybe the ocassional podium on a good day. The days of Schumacher owning a field are over, he'll still have his good days, he might even have the odd race victory still in him but he'll never dominate again. when the car is good, he's scary quick..
Edited 1 time(s). Last edit at 12/18/2011 10:14PM by Slash. Hungary 2005? He came 2nd to Kimi, whilst Alonso had a retirement. Hungary 1998, now that was an epic. 98-2004 was the peak of his talent!!! You're not very good at reading then, because my original comment wasn't applicable to any other driver, just Schumacher. And by the way, if you only gave your opinion on things there wouldn't be a problem - as it is, you tend to ram your opinion down our throats and then get abusive towards us if we dare disagree with it, which is an issue. The final part of your comment is too childish to bother replying to. Anyway... Yep, agreed with Jim. The reason I want to see him in a top car is because then we'd really see how much of the old Schumacher is still there. Apart from possibly his first ever race in the Jordan, he never had a car as bad as the Mercedes in his main career. Even the Benetton B191 was better. The Jordan 191 was a very impressive car especially since it was Jordan's first season in f1. It begun having to pre-qualify for every race which it did so with ease. It usually competed for points and was even in the running for victory at Spa (surprise surprise). It's main weakness was it's drivers in all fairness. De Cesaris was wasn't that good even at his peak, Gatchot was a Prat, Zanardi as much as we all love him was a rookie, Moreno was merely competent. The Benetton B191 was a decent enough car but the team benefitted from about a decade or more f1 experience than Jordan and also had a triple world champion (Nelson Piquet) as it's driver. It should indeed have always been the stronger team on paper but I don't the car was significantly better than the Jordan, although it's Pirelli tyres probably were a fair but inferior to the Goodyears. Agreed on all points there. The reason I'm inclined to see the B191 as better is because of its performance in the opening races of '92 on Goodyears, when it generally was only slower than the Williams. One thing though, if Button had stayed at Merc to partner Rosberg, would Schumacher have gone to another team, or would he just not have come back at all? I doubt he would have comeback at all in those circumstances. Kimi would have probably taken the Mclaren seat and I sense that Ross Brawn is the main factor that lured Schumacher to Mercdes. Otherwise it would have been Ferrari or nothing. I don't care about any of that personally. I'm not one for 'you should stop when you stop winning' - I've always subscribed to the 'you should stop when you stop enjoying it'. As sad as it can be for us outsiders to the see the likes of Barrichello struggling like he was last season, he's still doing what he wants to do, and as long as someone still wants you to sign on the dotted line, carry on doing it. Schumacher's not the driver he was, but I do think if you give him a car capable of getting a result, his eyes light up - look at Montreal! I don't think many weren't wishing him on to get a podium in a clearly inferior car, and he nearly managed it, even on the last lap coming back at Webber. I liked that he still has the tenacity and audacity to perform like that, but perhaps we don't get to see it as much as we should in the midfield. He's 42. He's not going to put in the performances he did in his early career to scrap out results, but even a less motivated Schumacher is more determined than most. I don't care that Petrov doesn't have a seat. He didn't look at all bothered after Heidfeld got fired, so yeah, Schumacher deserves that seat more. Heidfeld the same (though it is difficult to see when Heidfeld is motivated, as he's usually so dull in the car). It would be a shame not seeing Senna and Sutil in teams, and I'd like to see Glock in a better performing car again, but would I rather those than have Schumacher? Nah, probably not. I'm still holding out that Schumacher might get a podium. He's got it in him. Those guys still have plenty of years ahead of them. It's odd. 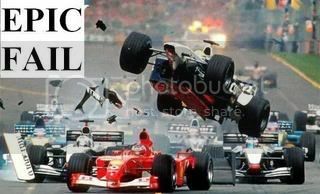 I never was a Schumacher fan. Obviously I appreciated his talent, but I never really liked him (and I'm not a really patriot)... yet since he came back I've found myself wanting him to succeed. Sport is weird. Also shows the difference between eras. When Schumacher made his debut in 1991 most of the established order were in their mid 30s to early 40s. Mansell won his championship in his late 30s, the likes of Prost, Piquet, Patrese etc had been around since the 1970s yet could still turn up the wick when they wanted to. In 97 Berger was the oldest man on the grid, he had 3 races off becausef of illness yet he comeback and won at Hockenheim even though he wasn't fit! Today... Most of the drivers are in their mid 20s, we've had a procession of "youngest evers" and many drivers are lucky to still be in F1 when they get to 30. When you look past Schumacher and Barrichello... F1's elder statemen are Jarno Trulli and Jenson Button. I still think of Button as a young up n coming whipper snapper, yet he's effectively a grandfather in modern F1 terms. When you look at it like that, for Schumacher and Barrichello to still be in F1 after 20 years and be competitive is an epic achievement, especially when today decent enough drivers are lucky to get 2 or 3 full seasons. I think that's changing back again now though. For a long time(which Berger's retirement probably established actually) there seemed to be a cut-off age for F1 drivers of about 37 years old, which is a ridiculously young age for a sportsman to retire at. Even Schumacher himself seemed to have succumbed to it when he retired at 37 in 2006. It seemed to be the unwritten F1 retirement age. This went against the standard practise from previous eras, when as said already, it was normal for drivers to keep racing into their 40s. I think it might actually be Schumacher's comeback which has changed this. Now we have de la Rosa making a full-time comeback at 40, and we have Rubens possibly staying on at the age of 39(will soon be 40 if he drives again next year) and even Trulli, who has a drive for next season despite being the age where 10 years ago he would've been seen as too old for F1. Maybe, just as Schumacher's arrival in F1 first time round revolutionised the drivers' work ethic and approach, so his comeback has reminded team bosses that drivers don't become OAPs once they're past their mid-30s. Edited 2 time(s). Last edit at 12/19/2011 09:08PM by EC83.